When Merck unveiled its Africa 2020 strategy in November, there was no shortage of ambition. The company announced plans to expand across the continent into new territories while upping its workforce to 1,000 from 400 with the intention of more than doubling sales from €200 million to €500 million. At the same time, the company also opened new offices in Lagos, Nigeria, and commissioned a new manufacturing plant for diabetes medications in Algeria which will create 500 million tablets a year and enable the country to reduce its import spend. At the forefront of this strategy is Fritz Sacher, Merck’s head of Africa strategy realization- a role he has held since January 2015. Prior to this, Sacher was managing director of Merck Portugal, with close links to Portuguese-speaking African nations including Angola, Mozambique, and Guinea-Bissau. Impressed by the scale of the ongoing plans, he recognises that reaching such goals will require robust planning taking into account the scale of the continent and the health issues it faces, and focusing on the countries with the best opportunities with the correct infrastructure and circumstances. To build on its success in Africa, knows it must be prepared to adapt to changing political and economic situations. The huge cultural, political and developmental diversity of the continent means there is no one-size fits all strategy that can be successfully implemented across the whole of Africa, but rather strategies must be adapted to the vastly different and variable individual statuses and realities of each country-or at least groups of countries that share similar policy. The countries in which to do business have been chosen based on factors including their size, political stability and importantly, GDP. The economic fortunes of certain African countries can fluctuate enormously however: even in the last year, Sacher notes, factors like commodity prices, oil and mining outcomes have changed considerably and created problems for the pharmaceutical industry. For example, the price of oil has a dramatic impact on Angola or Nigeria’s GDP, and large drops consequently lead to large declines in the country’s economic fortunes. Another aim on Merck’s agenda is increasing patient access to the medicines they need. During the company’s Africa Luminary Congress in Nairobi, also in November, capacity building was a focus- not only with regard to projects running in most of the countries in which Merck has an office, but also their neighbours. Capacity building was seen to be most crucial in cardiometabolic care, particularly in the form of public-private partnerships, but the countries also asked the company to provide even greater assistance in oncology, and in particular with improving the supply chain, where Merck’s knowledge can have a large impact. It was agreed that the company would set up seminars on this topic. Increasing awareness of its products for diseases that are becoming more prevalent in Africa is another important part of Merck’s work. Burgeoning life expectancy in many countries - increases of a decade seen in just a few years - has led to new healthcare challenges, with increasing incidence of non-communicable diseases, including diabetes. Where once diahorrea, malaria or even common colds were once the killers, diabetes and heart disease will take their place. Sacher comments: “Diabetes is a serious and developing problem for Africa and will become even more so due to diet. They are very heavy on carbohydrates and there is a lack of proteins, which is typical for Africa, especially in Sub-Saharan areas. It is also a question of increasing income: the middle class is growing quite rapidly but the population is growing even faster, so there are still many people or even a majority of people who are living in difficult conditions, feeding largely on carbohydrates. Cardiometabolic diseases are a huge challenge; on the one hand there is still the typical African diet, and additionally, a European lifestyle is coming in. Another scheme of which Sacher is particularly proud is its introduction of 600 portable testing laboratories for counterfeit drugs, which in some countries can account for up to 80% of malaria medicines. These small kits are capable of testing 75 different drugs, and can be operated by somebody after just a week of training. Elsewhere, great progress has been made in the fight against the parasitic worm disease bilharzia, which stunts children’s physical and mental growth, and can give adults kidney disease. 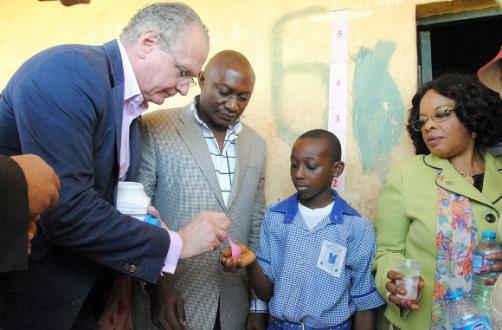 In Africa, around 200 million people are infected, and Merck has taken the fight to the disease by donating around 300 million Praziquantel tablets to the World Health Organisation, and treating 64 million children and adults, for free to date. Sacher says the company intends to scale this up to 100 million school aged children, which will require even larger volumes of around 250 million tablets per year. Sacher believes technology will also have an important role to play in both treatment and education, and that Africa in some ways has an advantage over Europe, due to not having to replace older infrastructure. The proliferation of internet and cell or smartphone access can already be seen in health outcomes, as he explains. Technology will also help create the next generation of much-needed doctors, and in increasing the medical knowledge of those already practising- as well as their links to remote patients. Merck has already taken steps to deliver the necessary platforms. Sacher explains: “They cannot create as many doctors as they need, so somehow they have to make medical services available in remote rural areas to manage those big distances. They need electronic systems. To train doctors, it is difficult to invite doctors from all over Nigeria for example to certain places, but you can train them remotely via electronic platforms. “In many countries, we already have platforms installed. For example, in Mozambique, we train doctors on diabetes, and we were asked by the minister to create such a platform. We now have similar platforms in Kenya and Ghana, and we will soon have it in Nigeria and other countries in Africa. Technology is as crucial as anything to improving health outcomes in the coming years, and E-Health, Sacher says, will be much more important to Africa than it will ever be to Europe, due to the great distances and scale of the continent. Creating a successful strategy in Africa may be a challenge, but Merck knows the rewards are there if it does it right, not only for the company, but for its patients. The next five years will decide the extent of that success.